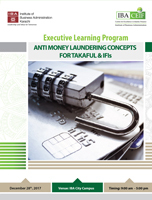 IBA Centre for Excellence in Islamic Finance is pleased to offer a one-day course on Anti Money Laundering Measures for Takaful & IFIs. The course is designed to provide a comprehensive understanding AML best practices and regulations in the Takaful and Islamic Financial sector. Participants will have an opportunity to understand the inherent money laundering techniques and risks that the financial community is faced with, and the mitigation strategies that can be adopted to protect clients and businesses. The course will be enriched with case studies and practical examples.